In what is being hailed as a bold, if controversial, move, Gov. Gavin Newsom signed an executive order earlier this month placing a moratorium on the state’s death penalty. The move takes 737 inmates off death row for at least as long as Newsom is in office, but it does not commute or reduce their sentences. The order also closed down the execution chamber at San Quentin State Prison. The governor discussed his decision and what the policy change means for California during a press call organized by Ethnic Media Services on March 19. California has the largest death row population in the United States as well as the largest in the entire Western Hemisphere. Thirteen people have been executed in California since the death penalty was enacted here in 1978. Since that time, the death penalty system has cost the state roughly $5 billion. No one, however, has been put to death in California since 2006 because of legal challenges to its lethal-injection protocol. The state decided then to, in effect, put executions on hiatus while it explored other options. In the U.S., 20 states, the District of Columbia and Puerto Rico have formally abolished the death penalty. In addition to California, seven states have a current official moratorium on executions, while three others have de facto ones. The military and the federal government have de facto bans on capital punishment as well. Newsom said that the death penalty is not only costly but also immoral and discriminatory. He pointed out that, since 1973, in this country, 164 people have been wrongly convicted, five of them in California. He went on to describe the process of execution as “error prone” and part of “a racist system,” with the death penalty being the ultimate manifestation. “I think wealth, so often more than culpability, determines outcomes,” he said. Newsom said that he has been thinking about the issue for close to 40 years and has long a record of opposing the death penalty. While he says he respects differing views and opinions on an issue that he knows is “hardly unanimous,” he says the issue has long weighed heavily on him, which is why he thought the moratorium appropriate. “I didn’t come to this over the course of a few weeks. It’s been a very strongly held point of view that I’ve had for four decades,” the governor said. 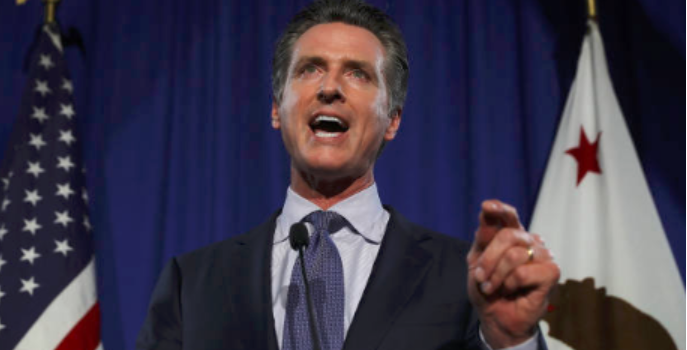 Newsom said that while he does believe in holding people accountable for their crimes, as governor, the ultimate judgment falls on his shoulders. Newsom also made a point to remind everyone that no one is being released because of this decision. The order, it should be remembered, does not bring the death penalty to an end in California but rather puts it officially on hold. Only the state’s voters can permanently repeal California’s death penalty. Days after Newsom signed the moratorium, Assemblyman Marc Levine, a Democrat from Marin County, introduced a constitutional amendment to abolish California’s death penalty. If approved by a two-thirds vote of the legislature, the amendment will appear on the 2020 ballot for voters to decide on. In the last six years, California voters have rejected two separate measures to repeal the death penalty.